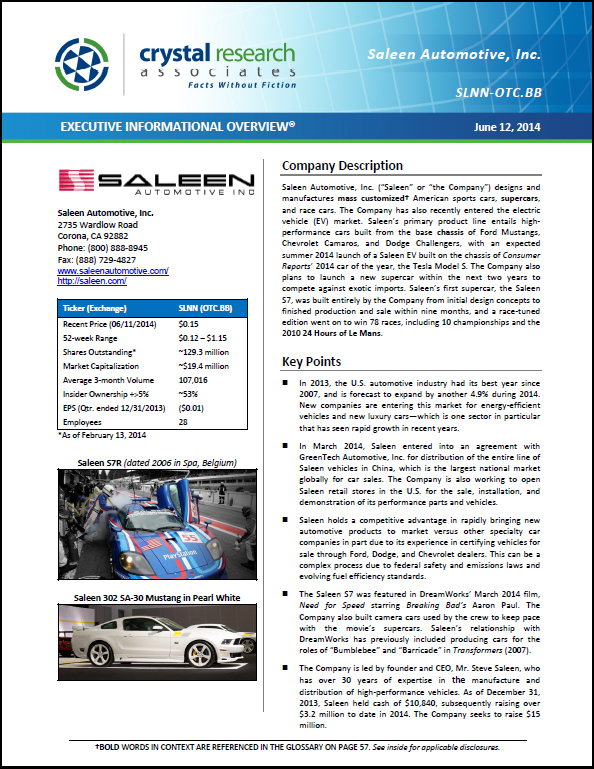 Saleen Automotive, Inc. (“Saleen” or “the Company”) designs and manufactures mass customized American sports cars, supercars, and race cars. The Company has also recently entered the electric vehicle (EV) market. Saleen’s primary product line entails high-performance cars built from the base chassis of Ford Mustangs, Chevrolet Camaros, and Dodge Challengers, with an expected summer 2014 launch of a Saleen EV built on the chassis of Consumer Reports’ 2014 car of the year, the Tesla Model S. The Company also plans to launch a new supercar within the next two years to compete against exotic imports. Saleen’s first supercar, the Saleen S7, was built entirely by the Company from initial design concepts to finished production and sale within nine months, and a race-tuned edition went on to win 78 races, including 10 championships and the 2010 24 Hours of Le Mans. * The Corporate Snapshot was last updated on June 12, 2014.